By Hasbro The world's most popular board game, featuring the new bag-of-money token! Buy real estate, collect rents, build hotels-but don't go broke! For 2 to 8 players. By Ravensburger One player, Mr. X, is on the run from all other players, using taxi, bus and subway in New York. Detectives work together using helicopters and roadblocks in an attempt to corner him. Mr. X, a familiar villain to fans of Ravensburger's Scotland Yard game, is up to his dastardly escapades in New York. This time it's NYPD detectives who are trying to apprehend the menace. This clever game of cat and mouse uses a beautiful map of New York City as its playing board. One player takes on the role of Mr. X (pick someone with nerves of steel! ), while two to five others act as detectives. The sleuths must use teamwork try to guess the position of and capture the crafty escape artist, who has the advantage of secretly moving around. The game ends after 22 rounds, which together take about 45 minutes. Pieces include chips, map board, tickets for public transportation (the only way players can move), and a nifty black visor for Mr. X so other players can't see him tracking his maneuvers around the board. By Toy State Industrial Now you can be one of New York's finest with this 14" motorized NYPD Chevrolet Impala or Motorcycle. Features forward motion, realistic flashing lights, sounds, vocal phrases, and even has theme music. Just like the ones seen on several popular TV shows. New York, New York is a dream come true for the puzzle enthusiast who suffers from insomnia. It is by far the most challenging Puzz-3D to date! Build some of the Big Apple's most venerated landmarks: the Chrysler Building, World Trade Center, Empire State Building and many, many more. 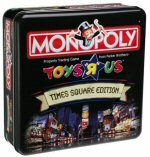 This deluxe edition takes you on a guided tour of the Financial district of one of the largest cities in the world. 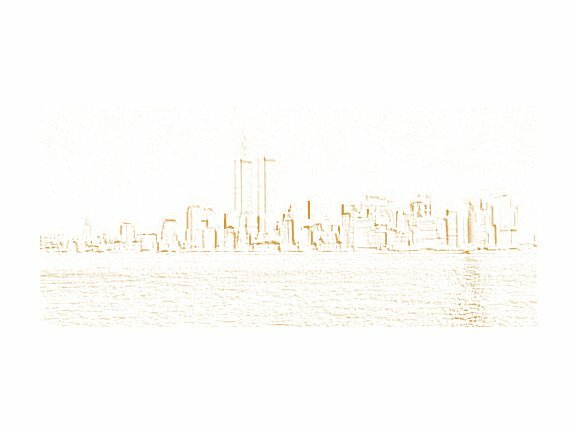 As you assemble the puzzle, you will discover Manhattan's history and architecture. Start spreading the news. It's up to you! The Brooklyn Bridge spans the East River and beckons all to Manhattan. A night-time view of this most famous bridge and the Manhattan skyline behind it present a stunning image for this 2000-piece puzzle. Beautiful Night time shot of lower Manhattan. This puzzle is 3 feet long and there are 750 pieces to this puzzle. 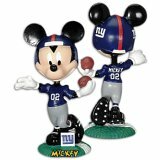 Giants Mickey Bobble Head Doll Collectible sure to score a touchdown with Disney and NFL fans alike. Hand painted Quarterback Mickey bobblehead doll is made of heavy durable polystone blend. 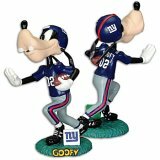 Giants Goofy Bobble Head Doll Collectible sure to score a touchdown with Disney and NFL fans alike. Handpainted Running Back Goofy bobblehead doll is made of heavy durable polystone blend. 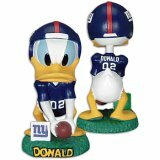 Giants Donald Duck Bobble Head Doll Collectible sure to score a touchdown with Disney and NFL fans alike. Handpainted Center Donald Duck bobblehead doll is made of heavy durable polystone blend. 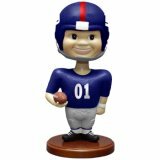 The Memory Company New York Giants Bobble Head Doll The New Yorks Giants Bobblehead Doll from The Memory Company is fun collectible for any fan. This 3-dimensional caricature is an excellent addition to your office or home collection. The officially licensed doll proudly displays the team's uniform. 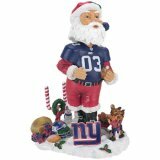 Forever Collectibles New York Giants Santa Bobble Head Doll Express your team pride during the holidays with this limited edition (5,000 produced) New York Giants Santa bobble head doll. This sequentially numbered doll is about 8-inches tall and made of durable resin. The bobble head features Santa standing on snow covered football field base in a team-colored jersey. This detailed base showcases: A reindeer choir and sled, a candy cane goal post, the team logo and helmet, a snowman, and Santa's sack. 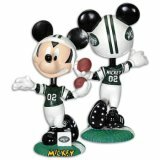 Jets Mickey Bobble Head Doll Collectible sure to score a touchdown with Disney and NFL fans alike. Hand painted Quarterback Mickey bobblehead doll is made of heavy durable polystone blend. 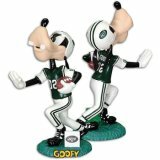 Jets Goofy Bobble Head Doll Collectible sure to score a touchdown with Disney and NFL fans alike. Handpainted Running Back Goofy bobblehead doll is made of heavy durable polystone blend. 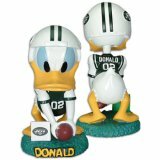 Jets Donald Duck Bobble Head Doll Collectible sure to score a touchdown with Disney and NFL fans alike. Handpainted Center Donald Duck bobblehead doll is made of heavy durable polystone blend. 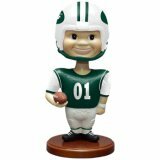 The Memory Company New York Jets Bobble Head Doll The New Yorks Jets Bobblehead Doll from The Memory Company is fun collectible for any fan. This 3-dimensional caricature is an excellent addition to your office or home collection. The officially licensed doll proudly displays the team's uniform. 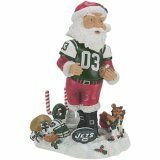 Forever Collectibles New York Jets Santa Bobble Head Doll Express your team pride during the holidays with this limited edition (5,000 produced) New York Jets Santa bobble head doll. This sequentially numbered doll is about 8-inches tall and made of durable resin. The bobble head features Santa standing on snow covered football field base in a team-colored jersey. This detailed base showcases: A reindeer choir and sled, a candy cane goal post, the team logo and helmet, a snowman, and Santa's sack. 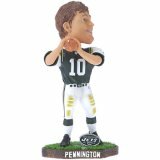 Forever Collectibles New York Jets Chad Pennington Game Worn Bobble Head Doll If you are a New York Jets fan, then this Chad Pennington Game Worn bobble head doll from Team Beans is for you. The 8-inch tall doll is made of durable col poly resin and stands in an action pose on a customized base displaying the player's name and team logo. 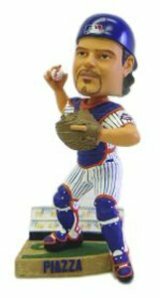 This officially licensed bobble head doll is individually numbered and proudly showcases the intricate details of the player's face and body, right down to the stains on his uniform. 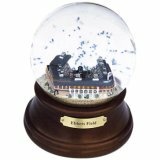 Sports Collectors Guild Brooklyn Dodgers Ebbets Field Snow Globe If you are an enthusiastic baseball fan, then this Musical Stadium snow globe from Sports Collectors Guild is for you. This 5.5-inch x 4-inch x 4-inch water contained, glass globe rests on a wooden base with a brass nameplate identifying the stadium. The distinctive snow globe plays "Take me out to the Ball Game" when wound, and displays a detailed stadium made of crushed stone and resin with team-colored swirling confetti. By Gemmy Industries Inc Folks will be dancing in the upper decks with the major league debut of Buddy Big League. Outfitted in a pro-style team outfit, Buddy will sing and swing to an original rock and roll version of the classic "Take Me Out To The Ball Game."